Anodes can be installed on a structure either with clamps or on doubler plates to avoid any coating damage. There is an urgent need for effective control of corrosion in process plants. Corrosion can contaminate the product handled, cause unsafe conditions to develop, or cause pollution if a vessel or pipeline leaks or collapses. On the contrary, efficient corrosion prevention can lead to economic development and extend the plant life, can lead to a reduction in downtime for plant replacement, a higher quality product, and a safer working environment. We have developed zinc and aluminium alloys that work efficiently in process plants and control the corrosion in the interior of the tanks. 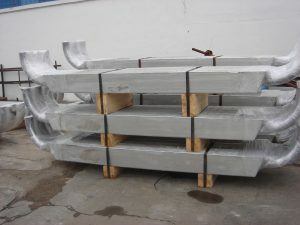 Anodes of several sizes can be manufactured in our factory and can be distributed worldwide.